This is a beautiful, sensitively told story of love and loss and of a special relationship between grandfather and grandson. Jake loves playing in Grandad’s workshop. One autumn day, Grandad teaches Jake how to chisel his name in a piece of wood, and afterwards they go to the park. Grandad shows Jake the tree that grew from an acorn he planted when he was a boy. Jake goes off to buy ice-creams and returns to find Grandad on the ground. The ambulance arrives. Mum and Jake go home without Grandad… Jake grieves for his grandfather all winter. But Grandad has left him his workshop and Jake wants to make something special. 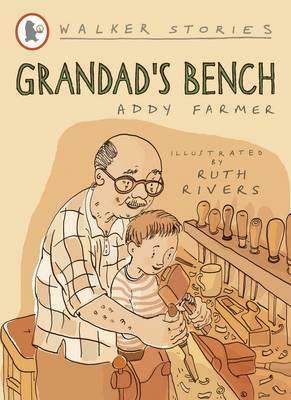 With Mum’s help, he does – a plaque for the bench under Grandad’s tree. It is spring; for the first time in months, Jake feels happy.